John Dickinson also writes historical fiction and science fiction. His father is Peter Dickinson. Learn more at John Dickinson’s website. CLICK HERE FOR MORE BOOKS BY JOHN DICKINSON. 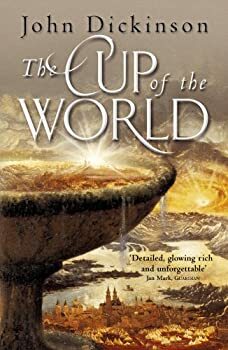 The Cup of the World — (2004-2009) Young adult. Publisher: Filled with immense characters, this thrilling medieval fantasy filled with moral complexity and vision announces the arrival of a special new writing talent. Phaedra, the beautiful daughter of a baron, has been visited in dreams by an elusive knight for almost as long as she can remember. And when his presence becomes a reality, she is forced to choose him and a new life over her home and her father. But this sets off a chain of events that she could not have foreseen — a battle between good and evil, which is in turn violent and psychologically compelling. This stunning novel grapples with the huge themes of life, and turns the reader’s expectations upside down again and again, with one vertiginious plunge after another.